El Mirador Townhouses Subdivision is in the central part of the North Area of Tucson, AZ. Shopping, restaurants, and activities are nearby at La Encantada This shopping plaza has many name brand stores and great restaurants. Tucson’s north area is established with many homes dating back to the 1960’s and 70’s. Some have been nicely upgraded while others wait for the buyer that recognizes the value and brings lots of TLC. The Westin La Paloma, The Hacienda Del Sol and Loews Ventana Canyon are noted resorts in the north area. Great views of the Catalina Mountains and Tucson City lights are standard features, but be ready to pay the premium the north area commands. The north area offers buyers a wide range of home architecture and lifestyles. but at a price. The north area has the highest cost per square foot of living space in the greater Tucson area. 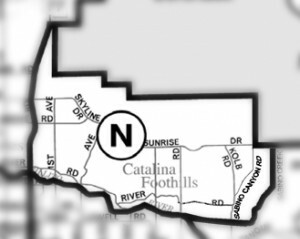 Families living in El Mirador Townhouses Subdivision are served by the Catalina Foothills School District – District 16. Restaurants to visit if you are living in the El Mirador Townhouses Subdivision or another subdivision in Tucson’s North area are Blanco Tacos + Tequilla and North Italia Restaurant. Both in La Encantada Shopping Plaza. Considering A Home In El Mirador Townhouses Subdivision? Are you thinking of buying a home in the El Mirador Townhouses Subdivision or another area of Tucson area? Finding the right home can be a challenging process. But we can make the process much less stressful for you. Thinking about selling a home in El Mirador Townhouses Subdivision? To no one’s surprise, 90% of home buyers start their search on the internet. Homes must be visible on multiple internet channels. The more visible a home is, the faster it will sell. We use multiple online marketing channels to showcase your home. We will build a stand-alone website built to show your home. Our marketing program targets key cities in the U. S. based on the season. For luxury listings, our drone service provides video of your home and neighborhood. This video along with professional photos helps the online buyer see and feel in your home.